Everyone wishes they were dead when wandering the purgatory of a home furnishings store, but these guys actually are. Goss is the quintessential good guy. When his boyfriend dumps him and moves out, Benji obligingly keeps the cat—even though he’s allergic—because his ex’s new place doesn’t accept pets. He’s always joked the cat would be the death of him, but not in a way he expects when a feline mishap crushes him under a DEL TORO bookcase. 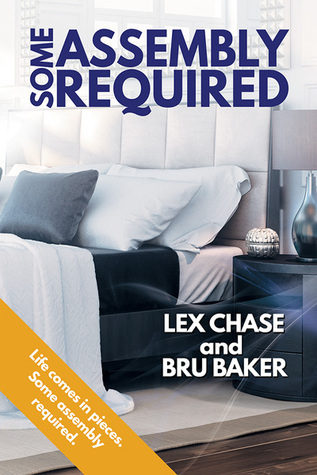 Some Assembly Required is unlike any M/M romance I've read. For one, both MCs are dead, ghosts if you will but with a corporal sense of themselves. They can eat and cry. They can move objects and change clothes at will. They can touch and smell. They hang out in CASA (the fictional version of IKEA), a sort of purgatory for lost souls. The concepts of heaven and hell are vaguely sketched but heavily based on Christian philosophy. Souls get stuck in CASA because they need to find closure before they can graduate to a better place. Every ghost who ends up in CASA was in some way killed by a CASA product, and there are thousands of them (although most don't linger). This begs the question: Wouldn't CASA have several class action lawsuits on its hands? How are they still in business if their products are killing so many people? Patrick has been at CASA for a long while (he dubs himself Employee of the Decade) when he meets sweet, innocent Benji, a new soul who's especially cognizant of who he is and why he's there. Patrick hides a world of hurt behind his snarky facade, but Benji makes him laugh and feel again. It took me a while to get into this story, but I couldn't not love Patrick and Benji, especially Benji, a kindergarten teacher dumped by a man he loved and killed by a CASA bookshelf he poignantly bought as a present for himself. When Benji runs into his ex shopping at CASA with his husband and daughter, he has an epiphany of sorts and can finally move on. The scene with Benji and Charles was incredibly poignant, rivaled only by the last chapter when Patrick finally surrenders and leads Benji to the light. There is a long slow burn between Patrick and Benji, but the coming together at the end is beautiful and EXPLOSIVE. I found parts of this story confusing. I still have no idea who Agnes and Henry were: angels? I also wanted to know more about Patrick's life before he died. Even so, I'm giving this book 4 stars because of the genuine emotions it invokes. So is there an end after the end, a HEA after death? Walk out the door and see. The robins are still there.